The title for this event came as an inspiration to Andy in August this year. When I tuned-in to these words, I was then told their hidden meanings. Golden – Colour of the 12th Ray which is the culmination of all the lower rays merging into Oneness with our Divine Self. Also refers to the new cycle which we are about to enter, know as the Golden Age. Lastly, the symbol ’12’ relates to the 12-dimensional nature of us, the star-humans. Mirror – from 12th December (12.12) to 20th December, that is for a total of 9 days, the energy of Lyra will be anchored gradually onto Earth as a stimulus for activating our DNA potential and to provide the support for Earth’s transition to the 5th Dimension. By the 21st December, Lyra’s presence will be mirrored or fully reflected upon Earth through our collective intent and combined light bodies. In essence, the date 21.12.2012 mirrors the activation of the Lyra portal which begins on 12.12.2012. Time – 21.12.2012 as the gateway for Earth to experience a complete alignment with the Lyra system of 12th dimensional consciousness. Abbreviated event title GMT – similar to the Greenwich Meridian Time (GMT) which holds the balance of no-time, the Golden Mirror of Time celebrates the balance and alignment of all life forms within the Milky Way Galaxy marked by the alignment of Earth, Sun, Central Sun and the Galactic Equator on 21st December 2012. Participants will receive messages, healings and blessings from the Spiritual Hierarchy, Galactic Council, Elohim and Archangels for soul empowerment as we begin the Golden Age. One of the highlights includes a group meditation to share the gift of awakening with Mother Earth, Tara. 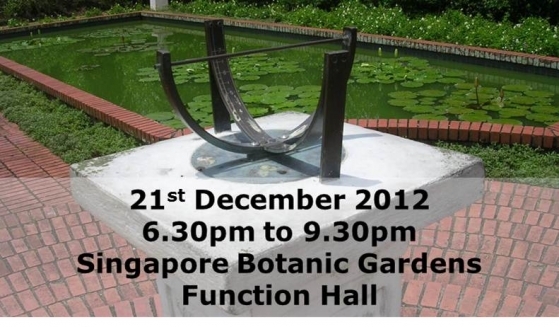 For this reason, the Singapore Botanic Gardens was chosen as the venue. Full program is available at GMT Program. Admission is free. Registration is required to secure your seat. Intent creates. If you wish to be part of this celebration, simply give the intent for your higher self and your spiritual bodies to join us at GMT at the specified location and time. On behalf of our guides and the team of Earth Angels offering their services and support at GMT – Betty, Cezann Mer’Sindor, Kheng Chye, Lyn, Vincent, May, Tshee Yeen and Sook Yee – Andy and I look forward to celebrating the dawn of a new World Age with you. Please register Joanna Johnston and myself to attend the Golden Mirror of Time event in the Botanic Gardens. Sure, Luana. We looking forward to receiving both of you. Blessings, Ann.